I vividly remember the first time I visited the Central Bureau for Genealogy in The Hague. I must have been about sixteen years old, and had just started doing genealogy. My mom also became interested and went with me. When we checked the catalog, we found that there was an envelope with prayer cards of people named Flooren, my grandmother’s maiden name. 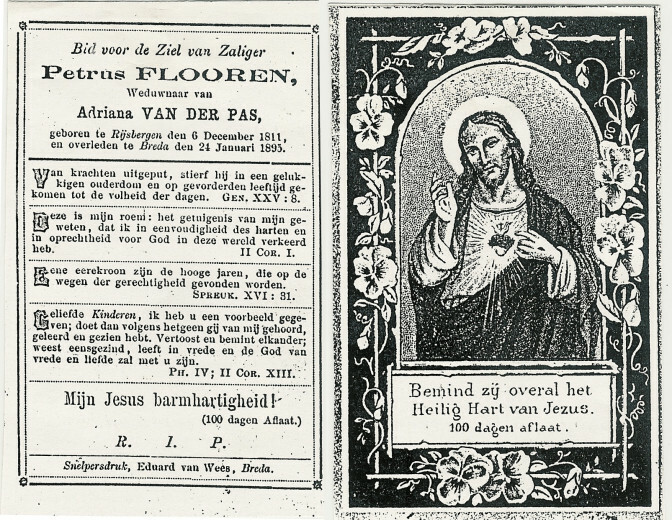 Within minutes, we held the prayer card of Petrus Flooren, my three-times-great-grandfather. My mom and I were very excited about this find. But we were sternly spoken to by another visitor, who warned us not to steal the card! We were shocked that he would think that of us, we were just very grateful for the opportunity to make a photocopy. The scanned copy below doesn’t do it justice, the original was very beautiful with black and gold ink. What are prayer cards anyway? Sometimes death records are not available, for example if the death took place less than 50 years ago so the record isn’t public yet. You may be able to glimpse information about their personalities or lives from the quoted bible verses. 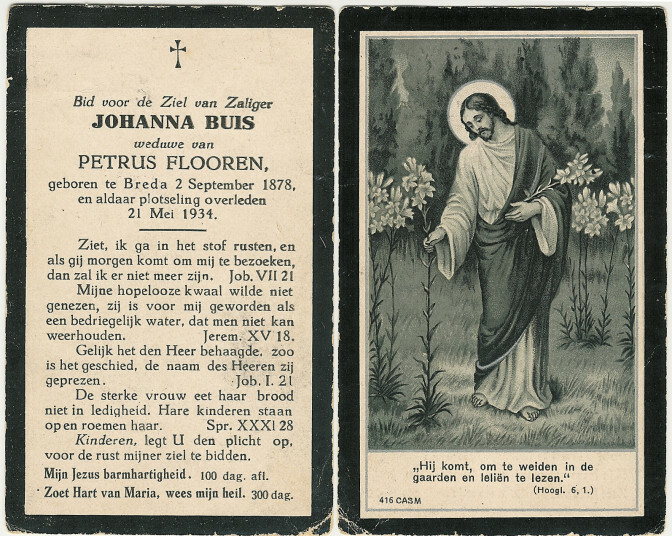 For example, the second bible verse on the prayer card of Johanna Buis translates to “My hopeless ailment would not be cured, it became to me a treacherous water, that could not be resisted,” which suggests she died after a lingering illness. The prayer card may reveal the name of a previously unknown spouse. The card will give you some insights into the religious beliefs of your ancestor. They make great illustrations for a genealogical publication. Prayer cards are documents created by the family, not the government. The first place to look for them is in your own family. But many historical and genealogical societies also collect prayer cards, so you might try your luck their. One of the largest collections of prayer cards in the Netherlands is owned by the Central Bureau for Genealogy. They are digitizing their collection of over one million prayer cards. Until they are available online, the only way to view them is on-site in the reading room in The Hague. Just don’t steal them! Another bonus from prayer cards is that some include a picture of the deceased. When I first started researching my Dutch side of the family, I dumped out one of the drawers in my grandmother’s dining side board which contained many prayer cards that was sent to my great grandparents in Canada from their cousins left behind. It helped me confirm the towns where the family came.